Every Monday morning at 9am PT (6pm Paris time) we have our company All Hands. They cover a lot of ground but rarely take more than 30 minutes. (I am a firm believer that transparency makes the team more efficient, more effective, and more engaged.) Our employee engagement surveys confirm that the degree of information we share each week in All Hands builds trust and helps the team understand their impact to the company. 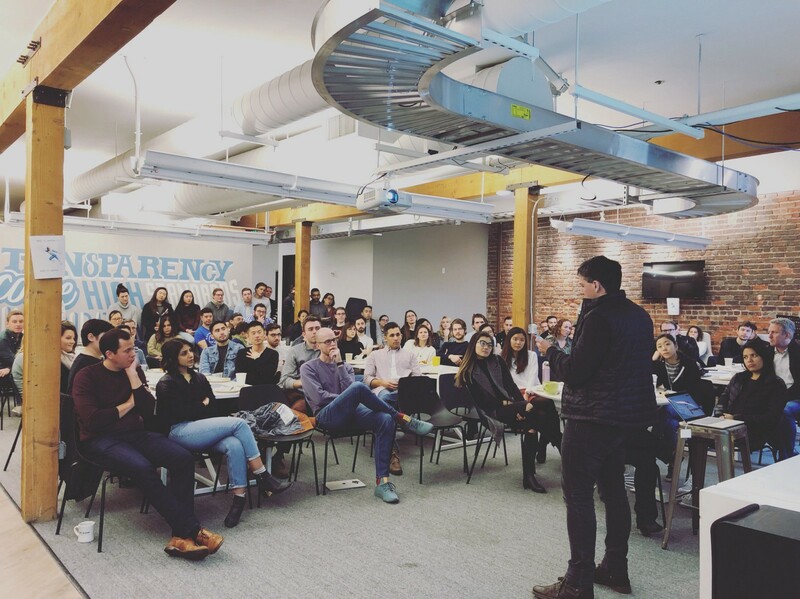 Here is how we run our All Hands and why I think it’s worth investing the time to make this meeting the best it can be. 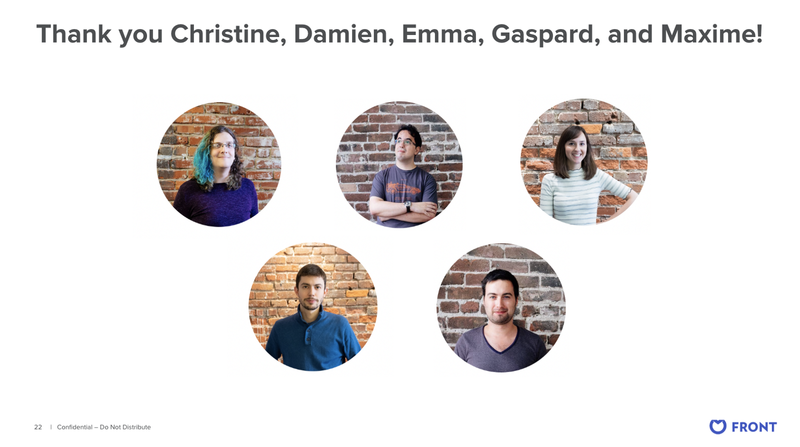 We now have a team in Paris so we use Zoom to bring everyone together. Our head of business operations runs the meeting and kicks us off with the agenda. We follow the same format every week. Whenever a new hire joins the company, we give them an opportunity to introduce themselves to the whole company. On their second week, they share who they are, their role, their impression of Front after their first week on the job, and then a picture or a talent that gives us a glimpse into who they are as individuals. Some people share photos of their families or a favorite trip or adventure. Some recent memorable talents include a rap about Front and a fencing match! 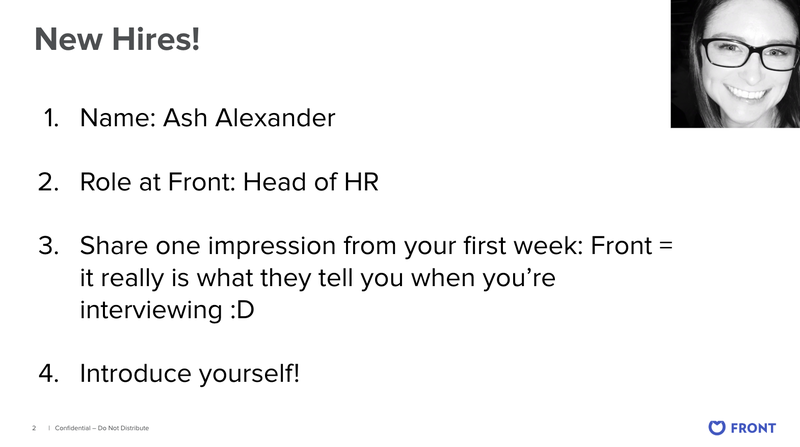 If there weren’t any new hires the previous week, we have an “old hire” — someone that’s been at Front for a while — get up and reintroduce themselves to their colleagues (most of whom weren’t around when they started). It’s a great way to make sure we’re connecting with our colleagues, new and old. We wrap up this section with a slide of the names and titles of people scheduled to join the company so everyone knows who they are on their first day. Now it’s time to get down to business. 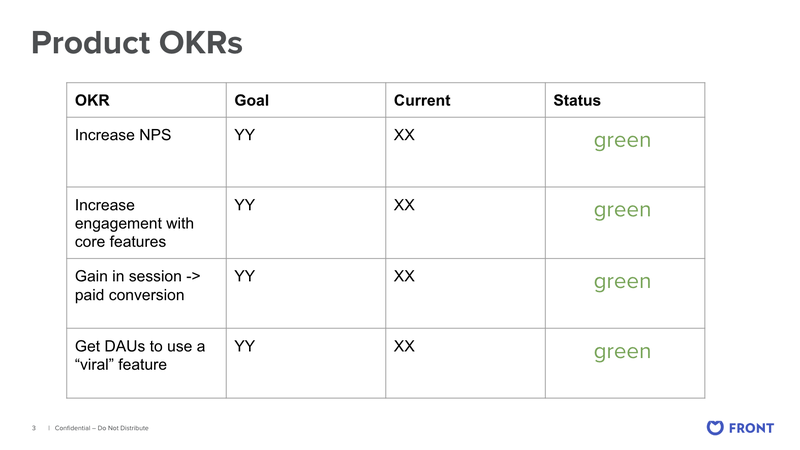 One of the main reasons our All Hands is so effective is that we use it to honestly report on our progress against OKRs. In this section, our product leaders explain how we’re tracking against key metrics like NPS, feature engagement, and free trial to paid conversion. 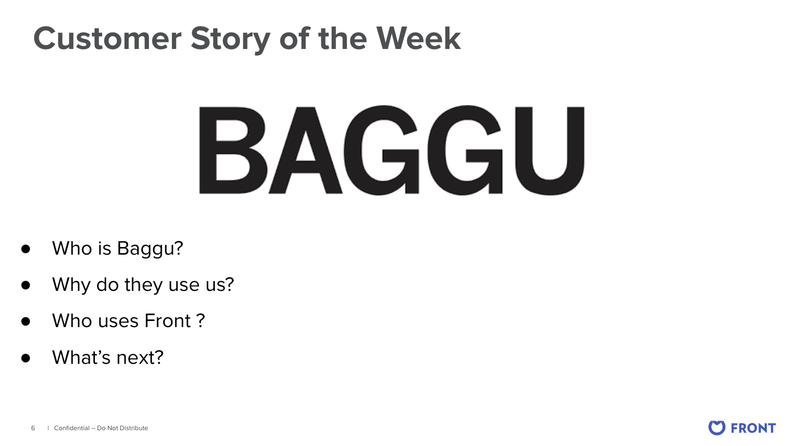 Each week, our product team also highlights some special work going on. 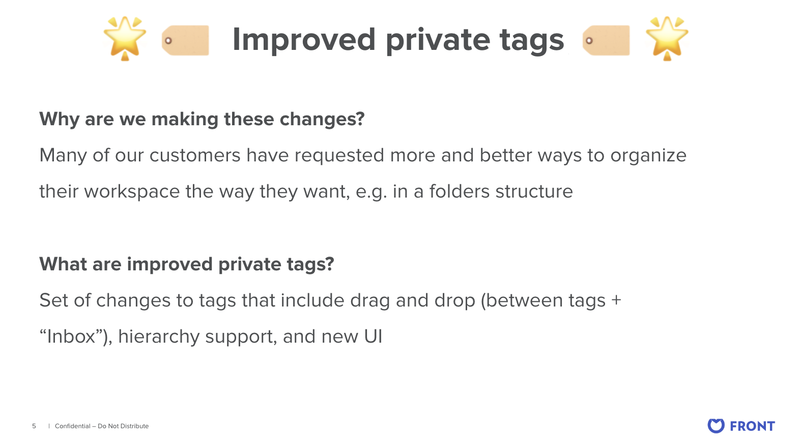 Whether it’s an update to the product roadmap or a deep dive into a new feature, we take time to inform everyone of the latest product developments. All Hands is also a great place to recognize the contributions of people on the team. We encourage presenters to thank the individuals involved in the projects they are talking about. I feel strongly that progress towards revenue targets should never be opaque to employees. I want everyone focused on our goals and proactively thinking of different ways to achieve them. You can’t do that if you aren’t armed with the facts about how the business is doing. Every week, we cover revenue, leads, and CSAT scores. Front is a horizontal product that can be used by any team anywhere. For that reason, it can sometimes be difficult to understand all our customers’ unique pain points. That’s why we spend a few minutes every week providing insight into a particular customer and how they use Front. 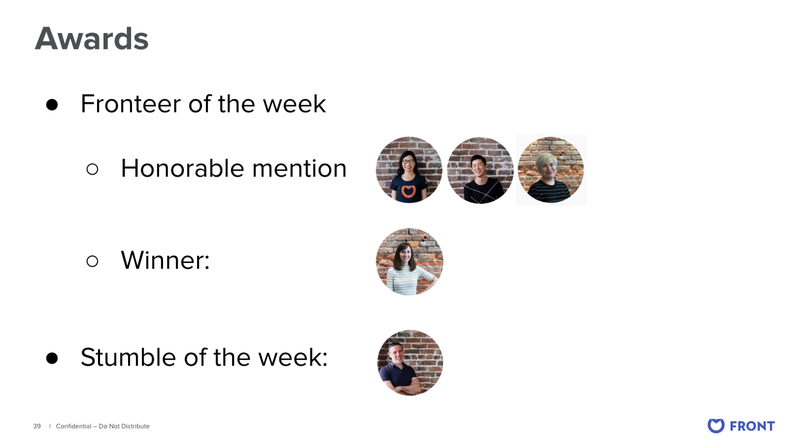 We rotate between a conversation of the week (shared by our Support team), a customer of the week (shared by our Customer Success team), and a deal of the week (shared by our Sales team). Each week, we have other special topics to address in our All Hands. Our head of HR might talk about new company-wide trainings or the details of our upcoming offsite. Some of our engineers might talk about the organizational and product security improvements we’re making. Or our marketing team might share the results of a recent campaign. 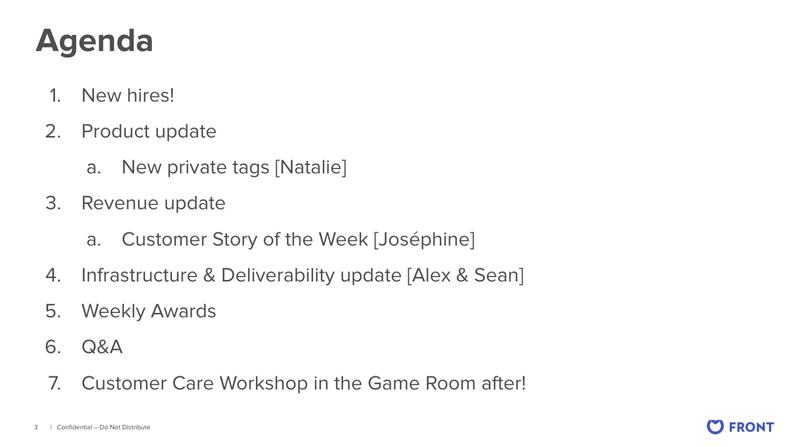 We try to keep each of these updates to less than 5 minutes each and aim for no more than two in each All Hands. I’m privileged to have Jared Smith, co-founder of Qualtrics, as one of my advisors and it is from him that I got this idea. Every week, we ask the team to nominate colleagues for Fronteer of the Week, and to nominate themselves for Stumble of the Week. Sometimes, I’ll tackle an issue or question that came up in 1:1s or one of my bi-weekly “Mathilde is free to chat about whatever you want” office hour sessions. If something happened to our industry (a competitor was bought or launched a new product, etc.) I’ll talk about it. Mid-quarter I’ll share a progress update on our goals. It’s also a good opportunity to share people updates (re-orgs, people leaving, promotions, etc.). We always end the All Hands with Q&A. Questions can be anonymously submitted ahead of time or asked live. I usually ask the appropriate person from my team to answer the questions relevant to them — i.e. product questions go to our head of product, HR questions go to our head of HR, etc. As you can see, our All Hands always covers a lot of ground, but like I said, we almost always keep it to less than 30 minutes. I think we can be efficient because we’ve made it a turnkey repeatable process. People know what to expect and how to share their updates without taking too much time. It aligns the team around our goals. We can all be more productive if we’re regularly reminded of what we’re striving for. Engagement makes people happy and effective at work. Providing your team with context and information makes them care more, which is the root of engagement. It forces accountability, which in turn should lead to better results. Transparency builds trust. People that are trusted with information are empowered to do their best work and will ultimately be happier. Want to follow our model for All Hands? Here’s a template of our deck. Let me know how it goes!